Traveling opens our minds to new experiences and our hearts to new people. It offers intimate opportunities to travel with our ministers to connect, learn, and grow. CSLDallas Spiritual Travel is a spiritual pilgrimage, inviting us to go deeper into our spiritual practice and teachings through the lens of the people and places we visit. Combining sacred places with morning spiritual practice allows us to learn and practice together. Eating, exploring, riding, and rooming together allows us to connect to CSLDallas folks in ways beyond compare. Experience the Roots of Science of Mind with Dr Petra for 7 Days! Join Dr. Petra Weldes for an exciting journey to New England to visit sights where the New Thought movement began. We begin our pilgrimage in Bethel, Maine at the childhood home of Ernest Holmes. We then travel to Belfast, Maine to the home of Phineas Parkhurst Quimby, the father of New Thought. Our journey then leads us to historic Boston, Massachusetts which is our home for the next three nights. We enjoy a day to explore Boston with the opportunity to walk the Freedom Trail from downtown Boston to Bunker Hill, visit Boston Common or see Copley Square and the Boston Christian Science Center’s magnificent reflecting pool. The following day we go to nearby Concord to visit the home of Ralph Waldo Emerson. We take at sacred walk at nearby Walden’s Pond and view Henry David Thoreau’s cabin. FILL OUT THIS FORM and send it to Spirit Tours along with your deposit. When your deposit is received, you are considered officially registered for this tour. Each day, we will come together as a community and do spiritual practice together and dive deep into the roots of New Thought and Science of Mind. After arrival in Portland, Maine, we are picked up by a charter bus and travel two hours to Bethel, Maine. Ernest Holmes, one of the foremost philosophers and metaphysicians of the 20th Century, acquired “the basics” of education in Gould’s Academy in Bethel. Today Gould Academy is a private, co-ed, college preparatory boarding and day school. The town of Bethel is a rare blend of farming, forestry, education and tourism. We will have a welcome dinner in Bethel this evening. At our morning meeting we discuss the importance of Ernest Holmes in the New Thought movement. We trace his history where he grew up in nearby Lincoln, Maine and his studies at Gould Academy. The first real town Ernest Holmes lived in was Bethel, Maine. In this small community he had his first exposure to a life of more than farms and forests. Much of his youth was spent in Bethel, where he received his only formal education and encountered his first actual church. After our morning meeting, we have lunch on our own before returning to an afternoon question and answer session with Dr. Petra. After our meeting we take a short, 1-hour drive along Sunday River Road. You don’t have to wander far out of Bethel to feel like you’re cruising through the forest primeval. The paved Sunday River Road branches off Route 2 just a couple of miles north of town, then winds past farms alongside its namesake stream in the shadow of the ski hill. 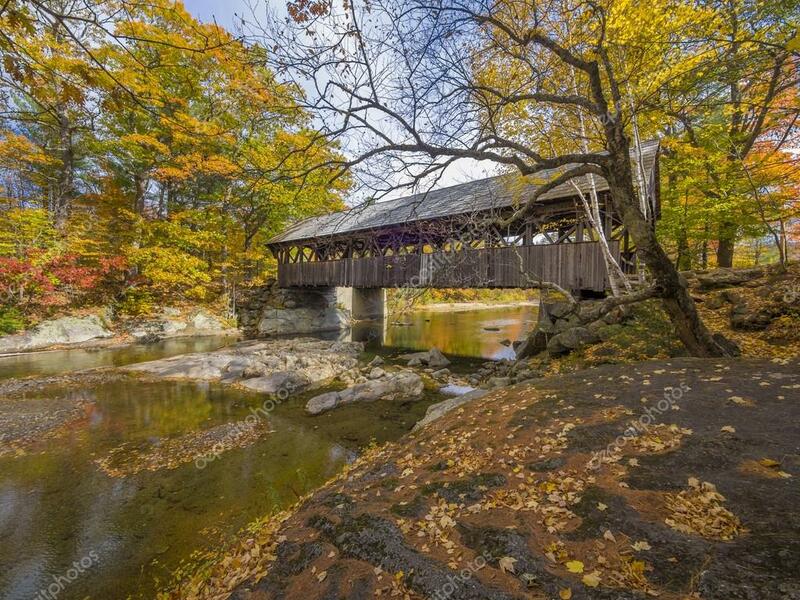 Four miles in, you’ll find the postcard-perfect Sunday River Bridge, built in 1872 and nicknamed Artist’s Covered Bridge because it is so often painted and photographed. 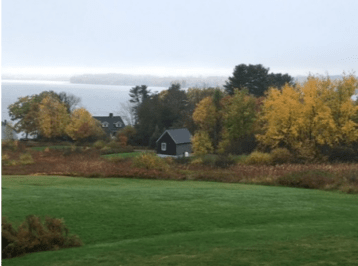 Returning to town we have the opportunity to explore the beautiful scenic town of Bethel and take a two-mile stroll along the Bethel pathway, a trail follows the Androscoggin River. This will be a short meditative walk. Afterwards, we have the option of dining with the group or not on our own in a Bethel Restaurant. After arrival our morning meeting Dr. Petra introduces us to Phineas Parkhurst Quimby. He was a nineteenth-century mystic, healer, humanitarian, and scientist who initiated a contemporary philosophy and called it, “The Science of Health and Happiness.” His insight into the relationship between beliefs held in mind and the experience were well advanced for his time. Quimby is the “Father of New Thought,” practical metaphysics and practical Christianity. His work laid the foundation for such movements as Divine Science, Christian Science, Unity, Religious Science and many more. We then travel by a charter bus and travel 1 ½ hours to Belfast, Maine which was the home of Phineas Parkhurst Quimby. After the morning meeting and lunch on our own, we visit the house on the corner of High and Spring Streets where Phineas Parkhurst Quimby lived and died and see the famous clock tower in the East Church of Belfast. We then visit the beautiful Grove Cemetery where Quimby was buried. 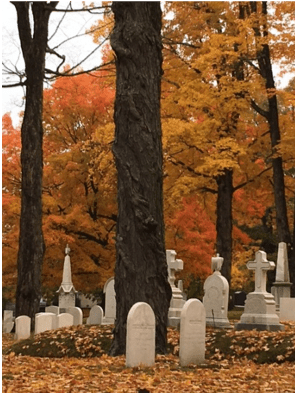 This is an ancient cemetery clothed in fall foliage this time of year which makes for a spectacular visit. 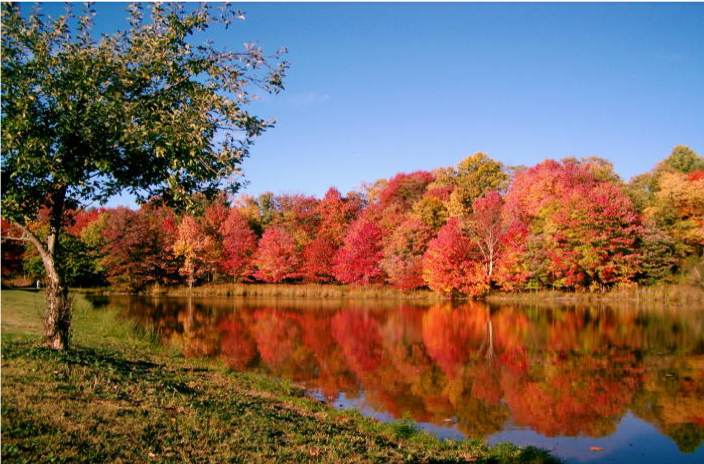 After our visit to the cemetery we go to Camden Hill State park for a beautiful silent meditative walk through the fall foliage. After the breakfast we travel along the beautiful scenic highway to Portland, Maine and then further south to Boston.Our home in Boston is the beautiful Seaport Hotel. Located in the Seaport District, one of Boston’s most vibrant and growing neighborhoods, the award-winning Seaport Hotel is a refuge in the heart of the city. Overlooking Boston Harbor and backed by beautiful city and water views, Seaport is the ideal location for business or family-friendly escapes, with easy access to Logan Airport, the financial district and all major Boston attractions. The hotel is proud to be one of the greenest hotels in North America. The hotel’s residential style décor makes you feel at home, and an onsite bar, free Wi-Fi and complimentary access to one of the city’s finest health clubs elevates your stay. We have the evening to have dinner and explore Boston on our own. This morning we discuss Emma Curtis Hopkins’ Notes on the influence of Emma Curtis Hopkins on Holmes. Mrs. H opkins, known as “The Teacher of Teachers,” introduced Ernest Holmes to mysticism, and he learned it was not something to fear but rather it was a deeper spiritual philosophy of life. Ernest had always known that he could contact the Infinite Presence within by becoming still and listening to the “inner voice.” He had already investigated psychic phenomena and had read about the mystics when he wrote the Original Textbook of Science of Mind in 1922. But in Emma Curtis Hopkins he met and had classes with a true mystic. In this small 80-year-old spiritual teacher, Ernest became grounded in the foundations of mysticism. He now clearly could teach the distinctions between mental science, which emphasized the psychological, and spiritual science that relied on the spiritual and the mystical. He discovered that his teaching up to that point, had been lacking the mystical element. Ernest was Mrs. Hopkins’ last student. After our morning meeting, we travel to Concord by coach and visit Emerson’s house and museum, which is a National Historic Landmark. He and his family named the home Bush. In April 1841, Thoreau accepted an invitation to move into Bush with the family. Emerson remained in the house for the rest of his life. In it he wrote his famous essays, “The American Scholar” and, “Self-Reliance”. He also entertained a host of notable neighbors and visitors including Bronson and Louisa May Alcott, Margaret Fuller. Afterwards we take a short ride to Walden Pond. 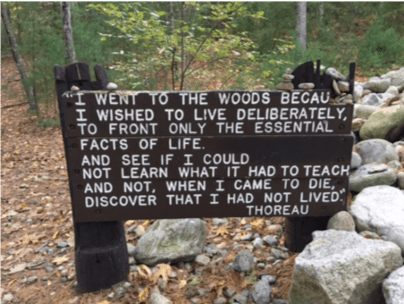 The writer, transcendentalist, and philosopher, Henry David Thoreau, lived on the northern shore of the pond for two years starting in the summer of 1845. His account of the experience was recorded in Walden; or, Life in the Woods, and made the pond famous. 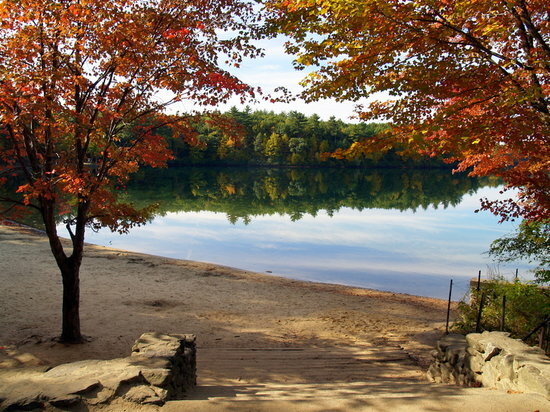 The land at Walden Pond was owned by Thoreau’s friend and mentor, Ralph Waldo Emerson, who let Thoreau use it for his experiment. We have the opportunity to walk around the lake and see the site where the cabin once was as well as see a replica of the original cabin. That evening we have our farewell dinner in Concord. Ernest Holmes not only read Emerson, but he also talked with much excitement about Emerson’s ideas. It was the idea of an independence of mind that Ernest found so rich and vital in Emerson’s writings. The poet emphasized nonconformity, which Ernest loved, for independence had been Ernest’s trademark for most of his entire life. “Be yourself,” Emerson wrote. “It is easy in the world to live after the world’s opinion; it is easy in solitude to live after our own, but the great man is he who in the midst of the crowd keeps with perfect sweetness the independence of solitude.” Ernest Holmes was 20 years old when he first read those words, and he reveled in the spiritual freedom that Emerson offered. Emerson said, “A man should learn to detect and watch that gleam of light which flashes across the mind from within, more than the luster of the firmament of bards and sages. He dismisses without notice his thought because it is his. In every work of genius we recognize our rejected thoughts; they come back to us with a certain alienated majesty.” When Ernest Holmes read these words, he knew he would not be afraid to recognize his inner genius and would dedicate his life to helping bring out that same inner genius in all people. This “individual interpretation” was a theme by which Ernest Holmes lived. Although he chose his spiritual path and never veered from it, he was tolerant of the opinions and beliefs of others. He never criticized another person’s ideas. After the morning meeting, depart for home! 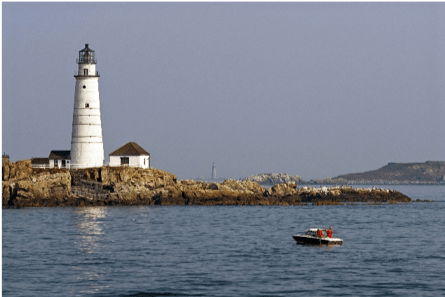 7 Nights hotel: two in Bethel, two in Belfast Maine and three in Boston Massachusetts.